codewiz and I (nom de nom) showed a wild demo at @party yesterday (June 14) at MIT. It was “Waves 3 Ways (Topsy’s Revenge).” Indeed, there’s video. also consisted of all printable ASCII characters. The source is about 1kb, without much effort at compression. And the sound, in addition to driving speakers, can be (and was) connected to a Tesla coil. 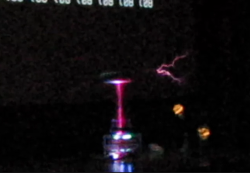 To connect the oneTesla coil he built, codewiz modified the firmware and the control box to allow the audio output to be read by the potentiometer input. He also wrote dsptee.c to improve the way the text scrolls. Topsy was the elephant electrocuted by Thomas Edison in 1903 to help prove that AC electricity (advocated by Tesla) was unsafe. My main disappointment was that the projector, which I thought would be HD and thus the same as my display, showed only the left-hand side of the video. I should have checked it more thoroughly before we got started. We were very pleased to get second place behind a nice oscilloscope demo. The final section of the demo is based on the bpNichol poem “Island,” part of his Apple IIe collection First Screening. This poem, in turn, refers to a concrete poem by Ian Hamilton Finlay. I’ve put a video/screencast of the end of the production online.